The Flash Movie Villains Are Captain Cold & Golden Glider? While we don't know much about the first Flash solo movie that Warner Bros. is working on, we may now know who the villains are. 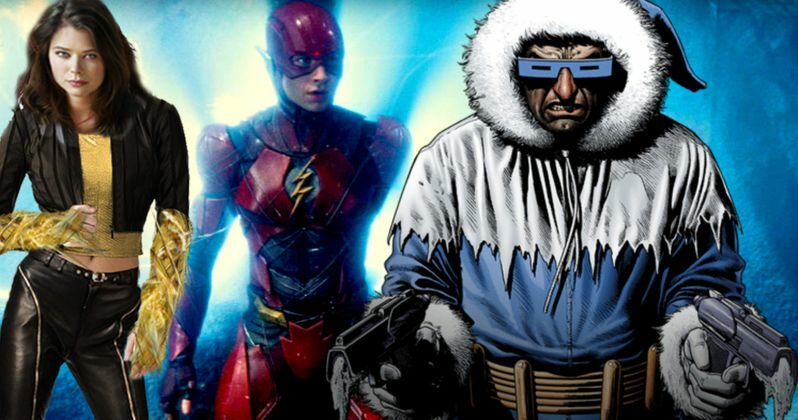 A new report is claiming that Captain Cold and Golden Glider are set to square off with Barry on the big screen. There are a lot of fans of CW's The Flash TV series who are a little upset that Grant Gustin isn't playing Barry Allen in the DC Extended Universe movies, and this may give them a little bit more reason to get grumpy, as both of those characters have appeared in the show as significant villains. According to a Tweet from Mashable's Jeff Sneider, the sibling duo will be the featured villains in The Flash solo movie, which is due out in 2018. This comes just after a report from /Film claimed that the Rogues were set to be the bad guys in The Flash movie. Captain Cold and Golden Glider are members of the team, but there are several members of the team, such as Heat Wave, Weather Wizard and Trickster, who are supposedly going to be left out. There is already some evidence that the Rogues are being set in the DCEU. "Seeing rumors about the Rogues in The Flash. FWIW, last week I heard villains are Rogues members Golden Glider and her bro Captain Cold." Captain Boomerang is also a member of the Rogues, and he recently made is DCEU appearance in Suicide Squad, as played by Jai Courtney. In the movie, The Flash made a very brief cameo in which he foiled Captain Boomerang, which resulted in him being in prison. That is why he wound up fighting alongside Harley Quinn and Deadshot in Suicide Squad. The Flash movie could easily use that altercation as some connective tissue to set up the Rogues in the future. Both of these rumored villains for the new Flash movie have been introduced on CW's The Flash, with Captain Cold played by Wentworth Miller, who also plays the character on Legends of Tomorrow, and Golden Glider played by Peyton List. While the footage from Justice League that heavily featured Ezra Miller as Barry Allen has been well received, there is still some animosity from Grant Gustin fans. The CW's The Flash is very well regarded, and the movies so far in the DCEU have not been, for the most part. So, bringing in villains fans of the show are already used to could be piling on. For those who may not be familiar, Captain Cold is the leader of the Rogues and is one of the most classic adversaries in The Flash comics. He is a master tactician and his main power is a gun that can freeze things, sort of like Mr. Freeze in Batman and Robin. Golden Glider is his sister who is an expert figure skater and has the ability to move at very high speeds. So, the two go together very well. Ezra Miller will next be seen as Barry Allen in Justice League, which is set for release on November 17, 2017. Rick Famuyiwa is directing The Flash solo movie, which is due out on March 16, 2018. Seeing rumors about the Rogues in THE FLASH. FWIW, last week I heard villains are Rogues members Golden Glider and her bro Captain Cold.